What is the latest rage in gardening? The unanimous answer heard and viewed on the east and west coast, in Ohio and also across the state in Kansas City was CONTAINER GARDENING. The rage at the first annual Eastern Performance Tours which was hosted by the garden centers and growers in Virginia, Pennsylvania and Maryland was definitely container gardening. 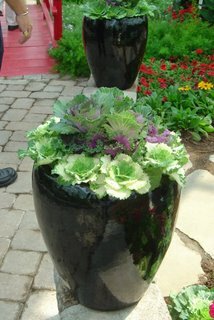 Outstanding displays with both annual and perennial flowers showcased the benefits of container gardening. Next, we went to the Western Show in Kansas City and once again we were treated to the keynote speaker Judy Sharpton bestowing the attibutes of container gardening or "thinking outside the box". Judy's eye opening presentation showed some great combinations. How does the maturing gardener who is downsizing and moving into a condominiums or villas with limited growing space but still want to garden, do? Its simple, container garden on the front porch or rear deck and change the flowers seasonally. The next trade show we attended was the Ohio Cents Show in Columbus Ohio and once again the hot topic was "container gardening". Suppliers had some of the greatest displays of unusual pots imported from around the world. The next stop was Downtown San Diego in their loft district. The lofts and condominiums in this area command a million dollars. Container gardening was evident on every floor of the condominiums. The sidewalks were alive with blooming flowers in extra large containers. Even the parks and plazas had large oversize containers with some of the most remarkable blooming flowers. How about St. Louis! We at Greenscape Gardens have seen a recent shift to container gardening and a recent visit with Bill Ruppert (sales rep with Walter Gardens in Michigan) and Gary Bohm (owner of Bohm Perennials in Maryville, Illinois) confirmed our position. Bill is spearheading an initiative with Charlie Brennan at KMOX radio to bring more "flower power" to Downtown St. Louis including container gardening. Stay tuned for some "out of the box" container gardening coming to Greenscape Gardens. We're sure you're going to like this new gardening concept.